1: Mistletoe and holly: little white or red berries with options for each kind of leaf. I think these would be great on their own, or to add to wreaths, table decorations, etc. 2: Pullover: this would be based on a simple pullover pattern, with striped sleeves, and a snowflake worked as intarsia on the front. 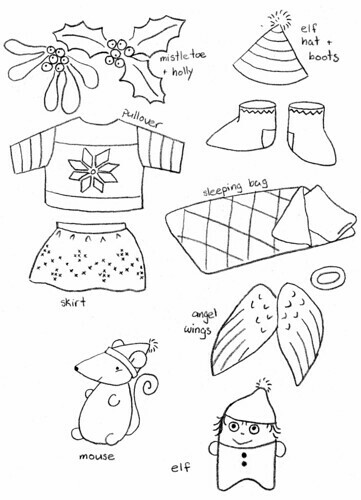 3: Skirt: to dress-up your toys for the holidays. It would be knit in the round (with optional instructions for knitting flat), possibly with stripes or a colour-work design. 4: Mouse: a small ornament, with bobble feet, and with head and hat sewn on. 5: Elf hat and boots: to fit smaller toys. A pointy striped hat, and boots with pointy toes. Both items would probably be easiest to design knit in the round. 6: Sleeping bag and pillow: simple and quick item to knit, and a nice addition to a gifted toy. 8: Elf: I know people probably wanted a full-size elf toy, but I just haven't time! This would be made similar to the mini alien (and much cuter than my terrible sketch). You have until Sunday evening to vote for your favourite idea. I'll choose the winning design based on which gets the most votes and which one I feel most excited to design. Hopefully it won't take too long to get ready for you, so you have a few weeks to get your needles busy! Posted by Barbara Prime at 10:05 a.m. I could knit them up with ribbon ties as last minute presents. November 20, 2009 at 11:30 a.m.
November 20, 2009 at 12:34 p.m. I love that little mouse! It has my vote too. November 20, 2009 at 1:11 p.m. I have to ask you for the tiny elf pattern. Your little alien is so cute, so I'm certain the elf would be. And the elf could be an ornament, stuffed in a stocking, attached to a wreath, hiding on a shelf, attached to a present, oh think of the ideas! Yes, my vote is for a tiny elf please!!! November 20, 2009 at 1:18 p.m. When I said this little cute elf, I was referring to a skinny body like the size of a walnut, with icord for legs, arms and pompoms at the end of the foot, small hands and a hat? How hard is that for you? I could attach a photo but it won't work and it won't let me do that. Please! Please! November 20, 2009 at 1:49 p.m.
November 20, 2009 at 1:52 p.m.
Anon: sounds like you have a good enough idea to knit that up without any help from me! November 20, 2009 at 2:41 p.m.
Sweater would be my first choice but the sleeping bag would be great too! November 20, 2009 at 3:04 p.m. I would love the sweater with the snowflake. I can already imagine a bunny wearing it! Thanks for your time and effort in drawing them for us to choose. November 20, 2009 at 4:48 p.m.
November 20, 2009 at 4:54 p.m. I have your pattern "Scrappy Chaps". How long does it take you to knit one animal? And where do you buy the safety eyes? Thank you. November 20, 2009 at 4:55 p.m. Mouse please, or holly and berries but I would love a mousie design! November 20, 2009 at 5:19 p.m.
First choice mouse, second choice holly and berries. Although you did make it very hard to choose, they all would be lovely! November 20, 2009 at 6:11 p.m.
November 20, 2009 at 7:04 p.m.
November 20, 2009 at 7:41 p.m. MOUSE!!! Your little drawing sold me on the mouse, very cute! November 20, 2009 at 7:48 p.m.
November 20, 2009 at 7:50 p.m. I just ♥ the angel wings! November 20, 2009 at 7:53 p.m.
No one else has voted for this but my first choice is the Elf hat and boots :) and my second choice would have to be the skirt! November 21, 2009 at 8:16 p.m. I love the mouse and the elf. Either one and I would be a happy camper! November 22, 2009 at 8:44 a.m.
November 22, 2009 at 9:02 p.m.
Angel wings please!!!!! Can dress up a ton of cuties! November 23, 2009 at 6:55 a.m.
November 23, 2009 at 7:59 a.m.
Why did you delete my comments? You were snotty to begin with and you were ashamed to let the world see my comment??? November 23, 2009 at 8:09 a.m.
Anon: I removed your comment because I did not believe it was in the spirit with which I wish to write this blog. I did not intend to be insulting or condescending, rather I was trying to encourage you to design your own toy, since you seemed to have such a good idea of what you wanted, and I thought that idea should belong to you. I began designing toys while still just a beginner, and I've found it's been a great way to learn new skills and progress as a knitter. I hope that you can do the same. November 23, 2009 at 8:15 a.m.
You could gather together the bottom of the coat, and stuff the body. Then you just need to make the legs with pom-poms, as you wanted. November 23, 2009 at 8:27 a.m.
What I don't really understand is WHY you asked us to give you some ideas and all of a sudden you gave me the impression I can do it myself... UGH! YOu leave a mixed message.... You just lost a valuable customer and I am somewhat turned by your comment. Thank you. November 23, 2009 at 8:29 a.m.
Anon: I am sorry you feel that way. November 23, 2009 at 8:41 a.m.
November 23, 2009 at 9:14 a.m.
November 23, 2009 at 10:47 a.m.